You have added Opening Night Strapless Maxi Dress in Beige into shopping cart. 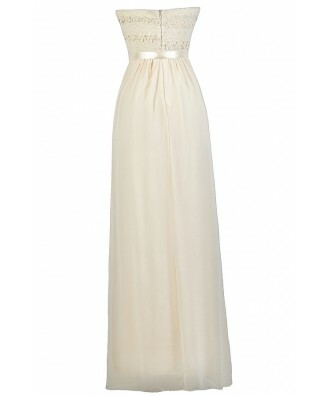 This ethereal maxi dress with dimensional textured lace is absolutely stunning! The Opening Night Strapless Maxi Dress is fully lined. It has a strapless sweetheart neckline with a plunging V dip in the front. The top is made of a unique textured lace with dimensional flowers that stand out from the fabric. The attached skirt is made of chiffon and has a full length maxi cut. A ribbon sash wraps around the waist and ties this look together. A hidden back zipper completes this dress. The Opening Night Strapless Maxi Dress looks nice dressed down with flat beaded sandals and a metallic headband for an angelic boho look. Or dress it up with beige strappy heels for a formal occasion. This would make a cute rehearsal dinner dress or bridal shower dress! Details: Made in USA. Fully lined. Lightly padded bust. Hidden back zipper. 100% polyester. Hand wash cold or dry clean. Small measurements: Length from top of bust to hemline: 55". Bust: 30". You have added Opening Night Strapless Maxi Dress in Beige into Wishlist. 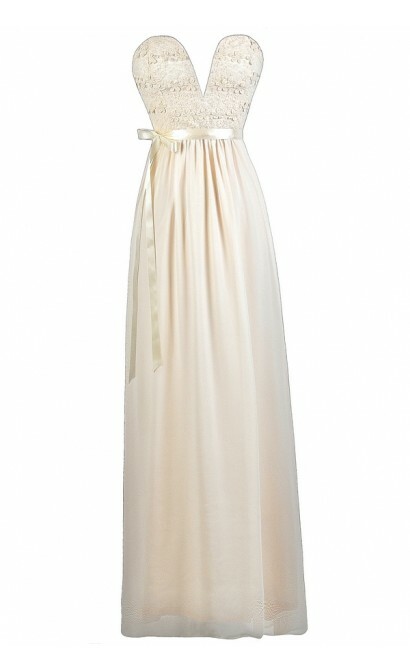 You have added Opening Night Strapless Maxi Dress in Beige for Stock Notification. You have set Opening Night Strapless Maxi Dress in Beige as a loved product. You have removed Opening Night Strapless Maxi Dress in Beige as a loved product.